Sathnam Sanghera’s memories of growing up as second generation Sikh in Wolverhampton; grammar school leads to Cambridge and on to a career as a journalist in London. Discovering his father, and subsequently his sister, both suffer from schizophrenia eventually draws him back to Wolverhampton to explore his family’s history and to have a long overdue conversation with his mother about marriage. 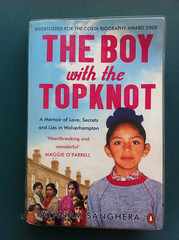 As Maggie O’Farrell’s quotation on the front cover says, it’s “heartbreaking and wonderful”.